After announcing the Lollipop update for the HTC One M8 was ready last week, HTC Australia have today announced that owners of the original HTC One – the M7 – will begin receiving their update from today. Announced via tweet, the update is apparently ready now. The announcement would seem to be directed at unlocked, Australian retail versions of the One M7, so owners should check for an update now. Carrier branded versions of the One M7 however may have a longer wait. The One M7 was offered by all three carriers here in Australia, such is the popularity of HTC phones. The latest updates on software rollouts for the various Australian carriers show that Vodafone is the only carrier so far to list the update as ready to roll, with their page stating ‘Technical acceptance granted. Awaiting rollout’. 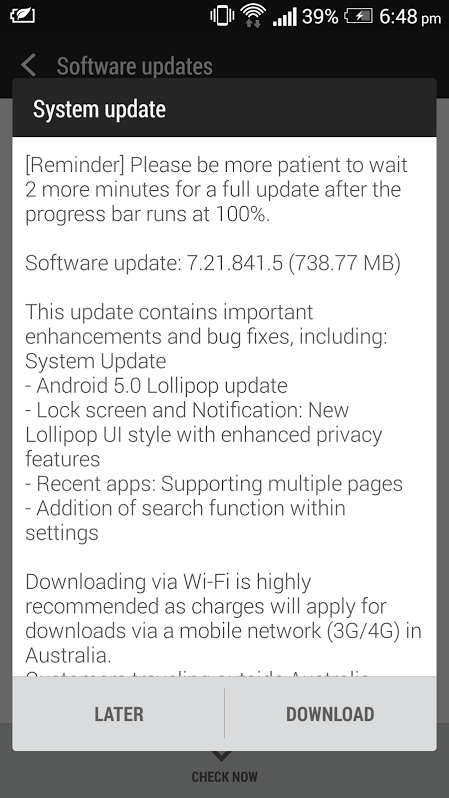 Optus hasn’t even listed the update on their page, and the most recent Telstra software update post fails to list the Lollipop update for the M7 either. Vodafone users should see the update quite soon if this is the case, while Optus and Telstra owners may face a slightly longer wait. To check for an update on your M7, go to Settings > System Updates > HTC Software Update > Check Now. You may want to be connected to Wi-Fi to download the update as it’s sure to be on the larger size. If you receive the update on your One M7, let us know what you think. Likewise, I've had a lot of problems with Lollipop on Nexus devices, but HTC seems to have addressed them all, it's actually running buttery smooth on my One M7 and I am yet to find any issues with it. By the way, it's 5.0.2, not 5.0.1. HTC one has been my favorite phone. I'm enjoying it! Vodafone version available and being downloaded as I type. Received via Optus...and downloaded last night. Took a while but it appears camera glitches (purple/blue haze) aren't addressed. Not too fusses as I'm not a shutterbug but there are others that will complain. Nice new options and formats to refresh things. Funnily enough, I received my update while I was in the US a few weeks ago. Hooray!